Here is a small teaser episode of my upcoming Natcation 2005 coverage. 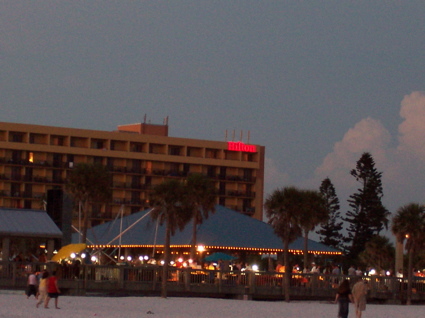 Well, here's how this goes down: at Clearwater Beach, Florida, there is a Hilton hotel. Sure. It sports the new swirly H logo, and is blue instead of Hilton's old red logo. Simple enough, right? But after it starts to get dark, all hell breaks loose. The sign -- and I am NOT KIDDING -- turns red! It is some strange phenomenon that you would see in a horror flick! I just can't figure out what is going on! 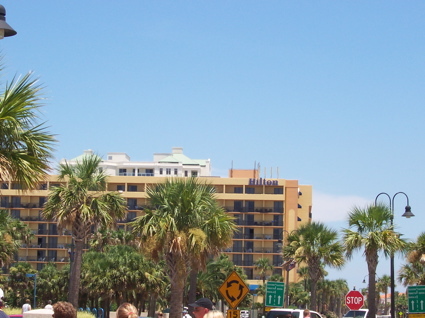 Who knows what those people at that Hilton were thinking when they made their sign change colors depending on time. I may never know. If you have any idea, drop me a line! Just a sidenote, everyone else thinks I am crazy for investigating this so far.